Greetings! It’s been a minute. But I am back to tell you about something very important and that is the joy that is Portland, Maine! Joel and I planned the trip without too much thought, looking for a cheap and easy place to go for a long weekend that it turned out neither of us had. However, as we researched more we became more excited. When it came down to it though, we really planned most of the long weekend on the spot. Here’s the sights we saw (and food we ate) in Portland and my suggestions for a perfect long weekend in my new favorite city. 10:30 AM: We landed at the Portland International “Jetport” (because I guess “Portland International Airport” was, well, taken) and soon realize that we can’t check into the airbnb until 4:00 PM. Roller bags in tow, we decide to head into the city to eat. Our Uber driver was the first of many very positive interactions with an upbeat and helpful local. 11:00 AM: We decide to go to Duckfat, where we were planning to get lunch. And good thing we did! The line had already begun for the restaurant that opens at 11:00 am. Within 20 minutes, it was entirely full and people were getting put on the waitlist. As our Uber driver had said, this is a foodie town. 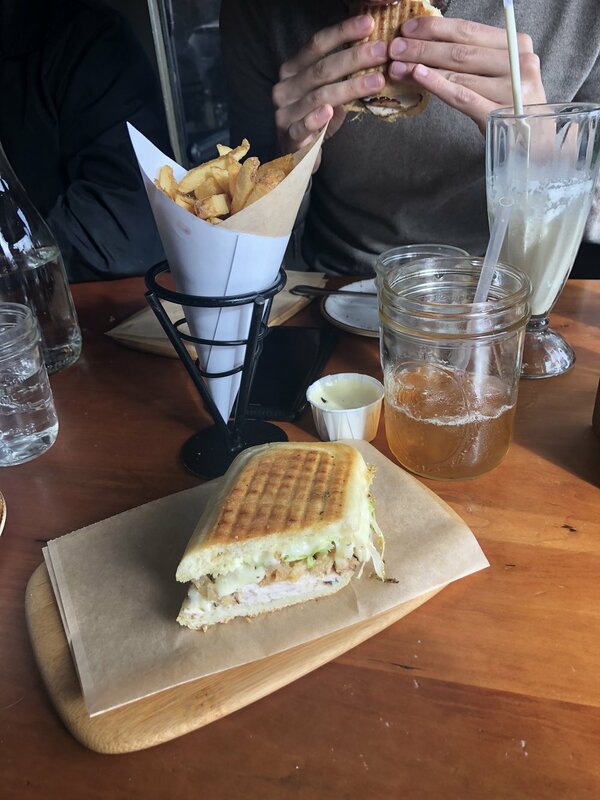 We ate the famous Duckfat fries with garlic mayo (amazing), a smoked turkey panini that sounds simple but was amazing, brussel sprouts with bacon and apples, and the most delicious orange donut holes to finish. Joel had their famous milkshake (what he said was the best he ever had) and I had one of their craft sodas, something like a root beer with cinnamon. It was definitely a great start to the weekend! 12:30 PM: Aiming to kill some time, we headed to the one store I’d been dying to check out in town, Judith. They had recently moved to a new, larger location. Floor to ceiling windows framed both ends of the store, filling it with natural light. 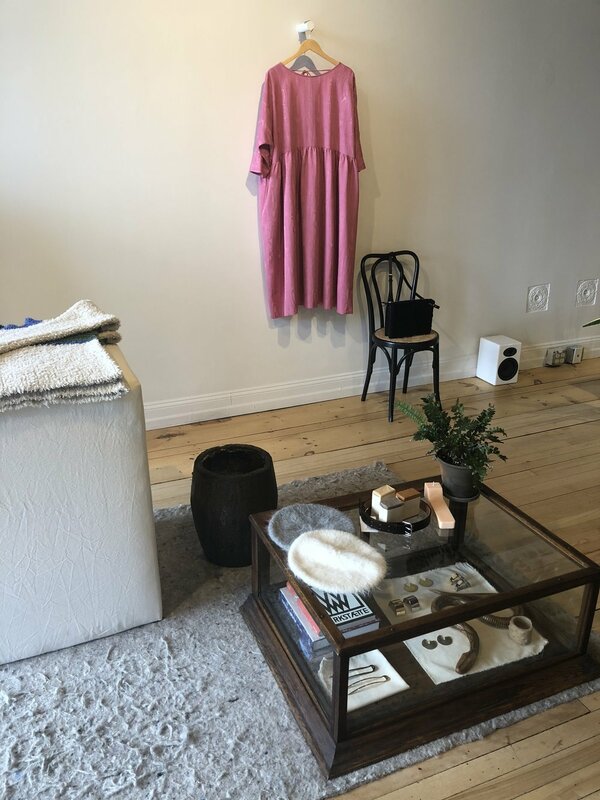 They carry some great brands like Jesse Kamm, Maryam Nassir Zadeh, and Ulla Johnson. The kind sales associate gave me a few recommendations of what to around the city as well, including Oxbow which I will get to later! Honestly the next few hours until we checked in at 2:00 consisted of us wandering along the water downtown and me complaining about needing to pee. We managed to find some amazing blueberry pie (a Maine specialty) at Two Fat Cats and settled down at the nearest Coffee By Design for Coffee. CBD (a confusing name to see on large signs all over the city tbh) truly has a monopoly over the local coffee scene, they have a special blend for nearly all the places in town. 2:00 PM: After walking up a hill in the rain with our bags, we finally check into our airbnb! This was the listing we stayed at. At first we thought the location was a little far from downtown, but we soon learned that everything looks much farther apart on the map than it actually is. It’s located on Munjoy hill, a quiet neighborhood with a very local feel. It was a short walk from the water, which was gorgeous to walk along. However, it was the space itself that won me over. After walking up some very narrow and steep stairs, we entered a true hideaway gem. I am a big fan of tiny homes and spaces, so this was truly my dream. Mini fridge, mini stovetop, mini room in general. But enough space to comfortably exist. I spent the next hour fawning over it while Joel ran. 3:30 PM: After running along the water, Joel urged me to walk along it before catching an Uber to the breweries outside of town. Very smart plan! The sun was just starting to set (that’s correct, it is nearly entirely nighttime by 4:00 this time of year), which gave an eerie yet peaceful look to the sky. There were gorgeous yellow leaves all over the ground. It was quite cold, but nice to walk along. The houses along the promenade by the coast are very nice. Not mansions by any means, and definitely not showy. But you can tell that the people who live in them could’ve done worse in life. 4:30 PM: After a short uber ride, we reached the breweries outside of town. One of the more well-known is Allagash, which is where we went first. They have $2 4 oz half pours and $4 8 oz pours on tap. Yes, that is correct. They’re really that cheap. The beer garden area looked crowded as we pulled up, but once inside it felt cozy and warm. And we managed to snag a seat! Thy had a great selection of beers, my favorites were the Monmouth Red (sour red ale aged in apple brandy barrels), Florette (a hoppy beer brewed with hibiscus petals), and Ghoulschip (a pumpkin ale soured on Halloween night). 6:00 PM: Next, we headed to Foundation Brewing, a newer brewery to the scene. My favorite here was definitely the Tropical Jam, a sour ale with passion fruit, pineapple, and guava (can you tell I love a fruity sour?). Here, you could create your own 4-beer tasting flights for $8 while at Allagash you could only get two half pours at a time. 7:30 PM: At this point, we decided to head back into town and try our luck at Eventide, the restaurant that basically everybody who had anything to say about this town had recommended to us. They’re known for their oysters, which neither Joel nor I are huge fans of, but I was dying to try their brown butter lobster roll. Upon arriving, we learned that there was an hour and a half wait for a table but we could just…stand if we wanted to. Screw it we said. So we just stood by the bar where most people were sipping drinks and ordered a full meal. Now, not to be dramatic but that brown butter lobster roll was quite possibly the best thing I’ve ever eaten. Not best lobster roll. Not even best seafood. Just best…thing. Let that sink in. 9:00 PM: After making a mess of the bar at Eventide, we headed to Vena’s Fizz House, a craft cocktail bar that had been suggested to me by a few people. It has the nostalgic vibe of an old fashioned soda fountain, but with the added excitement of being a bar with, ya know, alcohol. They do still serve plenty of delicious sounding non-alcoholic drinks! I opted for the Apple Crate, an autumnal mix of rum, apple cider, apple shrub, and cardamon. Joel of course went for some kind of Scotch drink that also included Brennivin which is some kind of Icelandic unsweetened schnapps. After that, we ubered home (even though we probably could’ve walked, it was starting to rain) and got an early night! 11 AM: We woke up a little late and got ready for an adventurous day on Peak’s island, the most populous of the Casco Bay Islands. However, before heading out, we wanted to get breakfast. Unfortunately, the ferry going to the island only leaves from Portland every two hours (!!) and due to our laziness, we would miss the 12:15 PM one if we didn’t hurry. Which is why I suggested…. 11:45 AM: The Holy Donut! This place was recommended to me by a few people and it did not disappoint. There was a small line out the door, nothing crazy though and it moved quite quickly. There are two locations, and we went to the one in Old Port by the ferry. These donuts are made by hand with a special ingredient: Maine potatoes! Unsurprisingly, the company got it’s start hand-in-hand with none other than ol’ CBD ( Coffee By Design). Joel got a dark chocolate glazed and I got a chai. For drinks, he opted for a chai latte and I, a peppermint hot chocolate. How fitting. The donuts are less like .a typical glazed donut and more of a cake donut, which is my favorite donut varietal. These were definitely worth the short wait! 12:30 PM: By now we were on the ferry on our way to Peak’s Island! We were joined with a group of people who could’ve been coming from town back home or visiting the island like us. It was hard to tell. Once on the Island, Joel mapped us to an honor system bike shop he had found online called Brad’s Bike Rental and Repair. I’m fairly certain it is one of about six businesses on the island, and the only one even slightly open this time of year. By open I mean that there is an open lot and a bucket where you’re instructed to leave a form with your info and cash for your bike. $10 for an hour. $20 for three. Joel chose a classic mountain bike while I went with a cute cruiser with a little basket on the front. As I’d soon learn, this was a mistake. 12:30 - 2:00 PM: So we ended up biking over an hour, leaving some extra cash in the bucket as we left. I don’t think I’ve touched a bike since middle school, so I was a little nervous at first. Not to mention, my bike squeaked as if the wheels were about to go flying off at any minute and the lack of gears made it nearly impossible to bike uphill on. Still, it was certainly better than a soulcycle class. The first half of the ride was mainly us fumbling through residential streets as Joel led us down numerous dead-end streets and, much to my chagrin, too far up a handful of hills (that I of course walked up). However, once we found our way to the other side of the island, it was unreal. I find it difficult to put into words. The vast stretch of ocean. The deserted street running alongside the ocean rocks. The cold breeze. The small hills and open roads on which to just bike and feel free. We pulled over and climbed on the ocean rocks for a moment, leaving our bikes unattended by the street. The waves crashed in and out and I seriously contemplated a future life living on this island all alone. 2:30 PM: To kill some time before dinner, we headed to the Standard Baking Co, a rustic warehouse bakery right by the ferry that was highly reviewed. As we planned the rest of our evening, we came to slightly regret this choice since all we had on the calendar was more food. However, I’d argue that the brioche roll and blueberry oat scone were worth the extra calories. 3:00 PM: Again killing time before our actual dinner, we checked out a brewery and distillery by the water in the old port area called Liquid Riot. Here we had, you guessed it, more food. Typing this I don’t understand how my stomach had the capacity that it did this weekend, but if there’s a will, there’s a way. We had a stuffed butternut squash that was to die for with a soft pretzel and beer cheese that was also amazing (can beer cheese every really be bad?). Here I opted for yet another build your own tasting flight of 4 small pours while Joel went with a whiskey flight. The smell of it alone made me want to bury my nose in my Cranberry Thanksgiving Ale, but he said that the Single Malt Whiskey he had was one of his favorites to date. 4:30 PM: By this point, it was still early in the night for dinner (yet almost entirely dark out) but we meandered BACK to Eventide. I simply had to have another one of their lobster rolls. We figured we might be early enough to grab a table but would take standing room if necessary. Turned out we were able to do both. We started this time with of course the lobster roll, but also a tuna crudo that was absolutely insane. By the time the waitress came to seat us, we’d eaten the two things we came for, but decided to also try the tuna tostado, a crispy tortilla covered with minced fresh tuna, pineapple, and some kind of spicy mayo sauce. Everything was, as was the day before, insanely delightful. 6:00 PM: After dinner, we decided to check out a brewery near our airbnb on the East End. However, we noticed on the map that there was a meadery next door! Now, ever since Dylan Sprouse announced his meadery a few years back, I’ve been dying to just try mead. I’d never had it before and was just so curious! Maine Mead Works was not exactly popping to say the least, but we got a very cheap mead flight and the softspoken bartender even gave us an extra half pour of apple mead on the house. We struck up a conversation with the Northeasterners next to us who were from Rhode Island and a small town in Massachusetts. The people here are just too nice! I digress, the mead. To be honest, I didn’t like the dry or semi sweet mead much. It tasted like overly sweet white wine, which is my least favorite kind of wine. However, the varietals that were meant to be sweet such as the blueberry, apple, and iced tea (my personal favorite) were delightful. I’m not sold on mead, but not NOT sold on it either. Still, I want to come back here if not to just support that sweet bartender. 7:00 PM: Believe it or not, a lot of the breweries we’d gone to the night before closed at 7:00. Not Oxbow. Perhaps this is because it’s in more of a residential area where people are able to stay out longer, but whatever the reason, it was the perfect place to end the night. The bar was a large, dark open space, and the beer barrels were all off to the side, in the dark. They were playing The 36th Chamber of Shaolin on a projector screen, which was a welcome stark contrast to the L.L. Bean chic vibe of the entire place. Always one for a sour, I tried a flight of 3 similar sours of varying depth. Joel opted for darks, naturally. After sitting for a while, we got a little hungry. Good thing Duckfat has a small friteshack” here where brewery bar patrons can order a cone of famous Duckfat fries and dipping sauce. The fries did not disappoint yet again! 11:30 AM: We grabbed brunch at the restaurant down the street from our airbnb. Tucked in the more residential area, The Front Room had a very “local favorite” feel. I ordered the silver dollar pancakes with famous Maine blueberries which did not disappoint. 1:00 PM: We planned to walk to the West End of town (about a 30 minute walk), and stopped into the Maine Jewish Museum on the way. Neither of us knew this, but Maine was a major early settling place for European Jews settling in America! It was a very quick walk through, but there were three great art exhibitions as well as a collection of portraits and stories from local Holocaust survivors that was quite moving. Definitely suggest popping in if you’re in the area! 2:00 PM: We had set our sights on checking out Tandem Coffee and Bakery on the West End since someone had recommended their biscuit sandwiches to me. After walking for half an hour, we were ready for our second breakfast. Or at least I was. The “loaded biscuit” was to die for. The huge salt crystals on the top of the biscuit perfectly balanced with the creamy butter and strawberries inside. Plus, the coffee shop itself has a great modern meets vintage vibe and is located inside an old gas station which furthers the ambiance. 3:00 PM: At this point, the sun was starting to set and we set course for our airbnb. On the way, we swung by Deering Oaks Park and also the Back Cove to take in the views. The Back Cove was gorgeous at sunset, and would certainly be an amazing place to run (something that Joel learned from experience but I did not). It was a bit of a walk to get back to our place, but a very nice one. And that just about wraps our time in Portland, Maine! It was truly an incredible place, and I encourage everyone to check it out sometime! I’m already planning a birthday trip back despite the fact it’ll be 20 degrees in March. I think I can kick it. I really tried to embrace the local aesthetic, thanks in part to my Everlane renew puffer (now sold out in yellow but here’s the green!) that I’m now in LOVE with and my vast beanie collection. Let me know if you ever go, would love to hear about your experience!